We are moving into birthday season in our family. And, shock horror, I'm about to become the mother of a 21 year old! He can't possibly be turning 21 already. It doesn't feel as though he's been my baby for 21 years but that's what the calendar says. Goodness I'm getting teary just thinking about it, he was such a tiny baby, relying totally on me for everything, not that long ago. Now he towers over me and is completely and utterly independent. Yikes! Before the end of the year we have nine family birthdays, including AJ's 21st! Thankfully most of them are adults, so the parties and celebrations are a little easier. But there are four children in that birthday bunch and they all love their birthday parties. To a child there’s nothing better than a birthday party. They have high expectations for the day and to be fair many parents do too. However, those high expectations can cost a bundle. 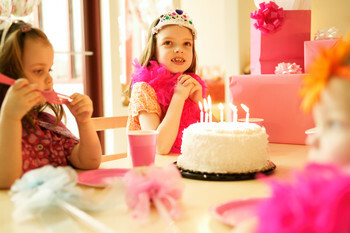 With a little planning and a smart strategy you can throw memorable birthday parties on a budget. When AJ, Tom and Hannah were younger we had a set birthday party routine. It kept costs down, but it also kept my stress levels down. It involved what we still call "the birthday box". In this box I kept all our party supplies: dishes, banners, balloons, loot bags, invitations, party hats, streamers, blowers, candles - if it was used for one of our birthday parties it was kept in the box. This made getting organized really easy. It's pretty basic and all homemade and it's easy to adapt for special diet needs i.e. Gluten free, vegetarian etc. It's also very cheap, doesn't require any special ingredients or extra things on the shopping list either. 1. Establish your budget first. Decide how much you have to spend before you even mention the word “Birthday Party” to your child. If you’re unsure how much you have to spend look at how much you’ve spent in the past. What were the financial results? Also take a look at your expenses and income for the upcoming month or two. You don’t want a birthday party to set you back. It is really easy to spend hundreds of dollars on a birthday part. It is just as easy to spend under $100 and have a party that will be remembered (for good things) for years to come. 2. Start planning early. The more time you have to plan the easier it will be to stick to your budget. It’ll provide you plenty of time for a little strategy and bargain hunting. How early should you start planning? It's not as though you don't know the birthday is coming up, it happens at the same time every year. Two to three months is a nice amount of time. Plenty of time to research, save money, and pull everything together. If you are stuck for ideas login to the Member's Centre and go to Birthday Parties. There are loads of great party themes, tips and recipes in the Journals for you to use too. Over the years we've had our run of fairy and princess parties, pirate and treasure hunt parties, pool parties, sleepovers, 13th birthdays, 18th birthdays and in a few weeks we'll be having our very first of the 21st birthday celebrations and I've used and will continue to use the ideas in these articles. They work, they save me money, time and energy - my type of birthday party. 3. Timing matters. The shorter your party, the less entertainment and food you’ll have to provide. If you are on a very tight budget consider setting the party time for between meals. Then all you have to provide is a beverage and cake. Of course you don’t want your party to be too short. Also consider keeping the party under three hours. For young children, up to about 12 years of age, two hours is plenty of time for a party. Over 12 two and a half to three hours is ample as long as you have plenty of activities for them or a good movie or game to keep them busy and entertained. Two hours may be the perfect amount of time for both party goers and hosts. Once your children reach 16 or so parties become more casual (don't think this means less work or expense, it doesn't) and they tend to also be a little louder and longer. It's all part of growing up , I remember the excitement of parties that went to midnight. These days of course my ideal party finishes around 9pm! On that note: always, always issue real invitations. I understand the kids love to put the details out on Facebook or use the bush telegraph to send their invitations but you have no control over who is invited. Take the time to make invitations, keep a list of who they've been given to and get an RSVP. It may be old fashioned, but it's good manners and good sense to know just who will be coming through your front door. 4. Utilize general themes. Skip the brand name parties and choose a more general theme. For example, Pirates are a cheaper theme to work with than Disney Cars and a princess theme is easier to work with than a Cinderella themed party. 5. DIY. Obviously time is money. However, if you can make a cake and create your own invitations you’re going to save a bundle. Consider buying some party decorations at a bulk or discount party store and making the rest. Get creative with the decorations too. 6. Make the craft the prize. Children expect to receive goody bags when they attend a party. Combine the craft (which keeps the children busy) with the goodie bag. For example, children could make pirate hats, tiaras or microphones to take home with them. If you are very brave let them decorate the party food. Make some large cookies and then provide the icings, sprinkles, jelly beans, smarties etc and let each child make his or her own snack. 7. Plan simple games and activities. Games are inexpensive and they keep children occupied and laughing. For example, a great game of kick the can or swimming in a pool keeps everyone happy and is inexpensive too. Pass the parcel, musical chairs, egg and spoon races, three legged races and balloon races are all good fun, cheap to run and keep everyone very busy. I have found that it is important to plan your party out in detail and carefully itemize the cost of each item. Make sure you also leave a bit of room in the budget and timeline for surprises – they always happen. Make what you can at home and keep the party short and simple. It’s the best way for everyone to have fun and to stay on budget. Now I've just shared my tips, I'm about to sit down and start working on the shopping list and final invitation list for that 21st. It's only a month away - time to get a wriggle on.